I don’t know which legislative branch to appeal to, but there ought to be a law that mandates life birds on a birder’s birthday. Perhaps we should require lifers on anyone’s birthday. Sure beats cake! I spent several hours of an otherwise excellent weekend dipping multiple times on a rare ABA Tufted Duck. Fortunately, Conesus Lake holds all manner of superb waterfowl, including more Common Loons in breeding plumage than I’ve ever seen at one time. That’s a win in my book. 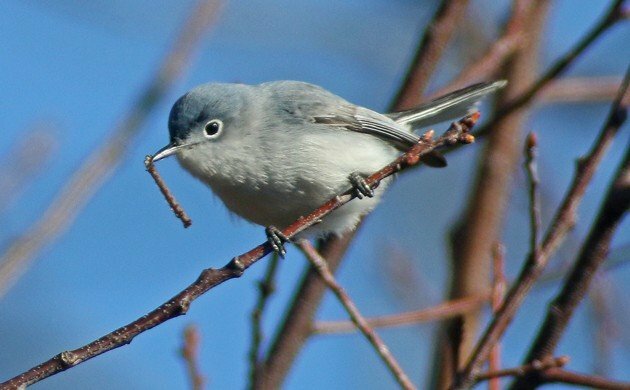 Corey’s Best Bird of the Weekend was a cooperative Blue-gray Gnatcatcher at Jamaica Bay Wildlife Refuge that contentedly foraged while Corey digiscoped. Not bad! This is a bit late, but as of 9 April, 2016, the White-Winged doves are arriving en masse in Mesa, Arizona. I’ve heard a few scouts in Scottsdale where I live, but a trip down the US 60 freeway told me that the white-wings are here! They’re like me, in that they actually migrate into the heat. Bring on summer! Three Surfbirds foraging at low tide on boulders just off shore with a small flock of Black Turnstones here on the Olympic Peninsula. With out any question, mine has to be the Large-billed Sparrow Passerculus rostratus. I am stll not sure if this sub of the Savannah Sparrow is considered a fully separate species yet or not, but I was excited to find them, and get some photos! These birds were found at the 2000 foot level, in the Sierra De La Laguna Biosphere. Sounds like a fine law to me. My best bird was a Black and white Becard at the excellent Locos por el Bosque cloud forest in Coronado, Costa Rica.